Myself and 6 other bloggers have come together to create a Grand Prize giveaway for 1 winner. The theme is On the Go and are things that you would use with a baby/toddler while on the go. Diaper bags, Baby wearing and so much more is included in this event. This giveaway goes live on November 15th!! I received the Orange Hero Sling from Rockin' Baby Slings. I love the color, it's super easy to use and so far I'm really loving it! I love the pocket at the end of the tail! Great for pacis, keys, cell phones etc. I love the bright color of this orange sling. It is truly gorgeous. Ring Slings are really easy to use, you thread the end through the rings, put baby into the 'pouch' and then tighten the pouch as best as you can. I was 29 weeks pregnant in the above pictures and as you can see, I can still wear my 22m old comfortably. I love the pocket on the tail. This comes in handy for things you need on hand quickly, but don't want to lose. 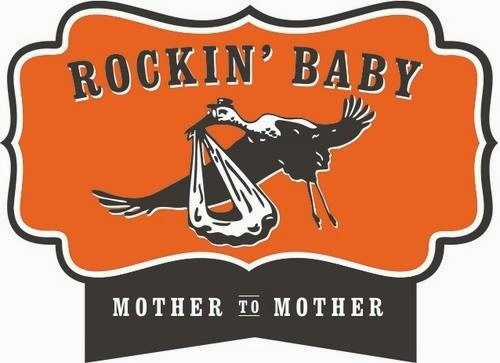 Rockin' Baby has a wonderful mission as well. For every sling purchased, they will donate a new sling to a mother in need, and educate them on the importance. MOTHER TO MOTHER. They donate the Orange Hero sling to all of the mothers in Haiti. Overall: ***** Wonderful company with a great mission.